Take a 6″ square of tin foil, place your garlic cloves (still in the skin) in the middle, top with the 1 T oil & season with salt. Pull all of the corners together to make a little pouch & place in the oven at 425 degrees for about 20 minutes. Once done, reduce the oven to 375. Place a large pot with salted water over medium-high heat for your pasta. When the water comes to a boil, add your pasta. Follow instructions on the box for al dente pasta and shave 1 minute off. In the meantime, add the rest of the oil to a large saute pan & heat over medium heat. Add the sausage and brown, crumbling as it cooks. Once cooked through remove from the pan and set aside. Add the onions and let saute for about 3 minutes. Sprinkle with a little salt then add the carrots & Brussels sprouts, cook for another 5 minutes or until slightly browned. Add in the mushrooms, mix well & let cook down for a couple minutes to remove the moisture. At this point you’ll want to add your cream cheese, mix lightly then add the chicken broth and stir to combine. Let cook down for about 2 minutes then add the roasted garlic, mashing it in. Add your reserved sausage. Stir in the Parmesan cheese and 1/4 cup mozzarella. If the sauce is getting a bit too thick stir in a 1/2 cup of your salted pasta water to think it out. Once the pasta is ready toss it right into the sauce & toss to coat. 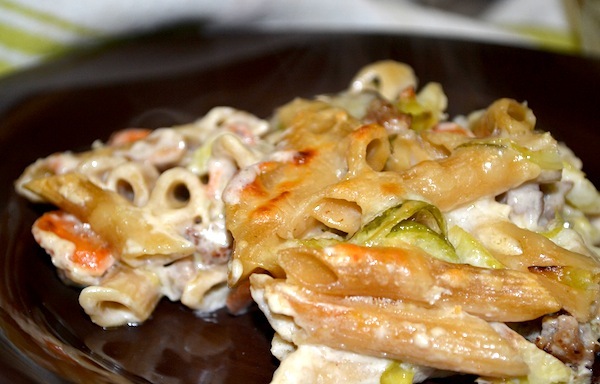 Place your pasta mixture in a 8×8 baking dish and cover with the rest of the shredded mozzarella. Place in the oven for 25-30 minutes or until golden brown on top. 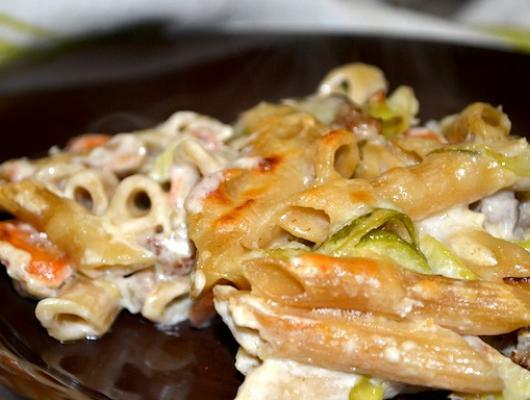 Sauteed vegetables in a roasted garlic cream cheese sauce tossed with penne pasta, cheeses & then baked to perfection.